EARN WHILE YOU SHOP! Scrip fundraising is a no-selling program that allows families to raise money for the PTA. It’s an easy way to pay for everyday purchases using gift cards. Please fill out and turn in order forms in an envelope marked “Scrip.” Make checks payable to “County Line PTA.” Cards are typically available within one week and can be sent home with your child or can be picked up in the school office the following Friday. The next Scrip ordering deadline is May 5th. Please join us for the April PTA meeting on Tuesday at 6:30 in Miss Beres’s room. Please enter through back parking lot doors and look for signs. Childcare will be available. PLEASE NOTE: Door will be open 6:20–6:40 ONLY. Call 262-470-2149 if arriving after 6:40 pm. Parents Night Out with SURGE! Get ready ignite, excite & explore during a Parents Night Out with SURGE! Kids can experience an evening of SURGE team demonstrations, martial arts instruction, activities, and games. Parents can enjoy a night out! The cost is $10/child or $25/family of 3 or more children. Participation is limited to 100 kids. Money will be collected by SURGE the night of the event. Don’t send money in before the event! Doors will open at 6:15pm for check-in. SURGE will require a completed waiver, which can be completed and turned in to school or the night of the event. Please wear socks/tennis shoes and loose clothing — and remember a water bottle. Parents aren’t required to stay; those that choose to stay may be relocated to another room due to gym capacity. As an added bonus, Old Town Beer Hall is offering a 20% discount on full-price food that night only! SURGE will provide additional info to interested parents at check-in. Comments Off on Parents Night Out with SURGE! Please join us for the March PTA meeting on Tuesday at 6:30 in Miss Beres’s room. Please enter through back parking lot doors and look for signs. Childcare will be available. 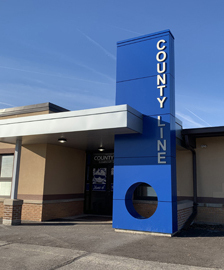 The County Line PTA encourages all County Line families to stay engaged in the ongoing elementary attendance boundary discussions with the District. The schedule below includes the current meeting schedule (as of 2/23/18). Monday night’s Transportation meeting agenda contains information about an alternate to one of the attendance boundaries that was presented last week. The bienniel County Line PTA Auction for Education will be held Saturday, March 10th. We need your help to make this event a success. Sign up today to help. Event registration fee will be reimbursed for each 3-hour block of volunteer time you complete. Please review the packet that was presented at Monday’s night’s Transportation Meeting. (Elementary attendance boundary options begin on page 66.) Please contact Superintendent Jeff Holmes if you have any questions or concerns about any of the options. The committee is set to meet again before making a recommendation to the board for its February 26th decision. The 2018/2019 Elementary Attendance Boundaries presentation will be given during the Transportation Committee meeting on Monday, February 12, at 5:30pm at the Germantown School District Administration Building. Family BINGO Night — register today! Join us on Friday, February 16, for Family Bingo Night at County Line School. Doors will open at 6pm for check-in; Bingo starts at 6:30pm. Registration for this event starts now. We have a limited amount of space so once we reach our capacity, registration will be closed. Registration will be limited to immediate families of County Line only due to limited space. We are looking for volunteers for help during the event as well as after the event to help clean up. Please contact Danielle Shira at [email protected] or 414-315-1677 to help. Again, registration is on first-come, first-serve basis. Once we reach capacity, registration will be closed. Due to limited space, Family Bingo Night is open to immediate families of County Line School students only. Comments Off on Family BINGO Night — register today! The next Scrip ordering deadline is March 9th. Please join us for the first PTA meeting of 2018 on Tuesday at 6:30 in Miss Beres’s room. Please enter through back parking lot doors. Childcare will be available. County Line PTA presents Family Movie Night, featuring Boss Baby. Parents can stay & enjoy the movie with the kids — or leave the babysitting to us — $2/per child. Pizza (provided by Grinderville) is available by the slice for prepurchase. Concessions — popcorn, bottled water, small snack — are available the night of the event. Bring your chairs, cushions, or blankets to sit on and enjoy the show! JUST IN TIME FOR HOLIDAY GIFT GIVING! Scrip fundraising is a no-selling program that allows families to raise money for the PTA. It’s an easy way to buy gift cards for gift giving or pay for everyday purchases using gift cards. The next Scrip ordering deadline is January 5th. Come make gifts to give for the holidays! Some of the projects students will be able to take part in this year include tie dye, cookie decorating, wooden magnets, ornaments, face painting & tattoos, gift jars, and more! A very limited number of punch cards will be available for purchase at the event for $15. Each punch card is good for one of each project. New this year: a photo booth! One picture is included with each punch card. We need help the night of the event! Please consider volunteering your time. Contact Heather Boettcher with any questions. Hope to see you there! NOTE: All students require an adult chaperone. Did you know you can support County Line PTA all year long? PrestoPay is the Scrip online payment system that uses the ACH debit process to electronically debit funds from your checking account. There is a $0.15 per order convenience fee to use PrestoPay. Find out more about this convenient feature of Shop With Scrip. The next Scrip ordering deadline is December 8th — just in time for holiday gift giving!